Blood cancer is a group of cancers which affect blood cells, blood forming tissues or the immune system cells. Blood Cancer that affects the immune system and especially the lymph cells which are type of the white blood cells. They behave, spread, and respond to treatment differently, so it’s important for you to know which one you have. Hodgkin lymphoma can start almost anywhere, most often it starts in lymph nodes in the upper part of the body. The most common sites are in the chest, neck, or under the arms. Hodgkin lymphoma most often spreads through the lymph vessels from lymph node to lymph node. Non-Hodgkin lymphoma is a cancer that starts in the lymphatic system in blood cells called lymphocytes. This cancer can be almost any place in the body. What are risk factors of Hodgkin Lymphoma? Age: People can be diagnosed with Hodgkin lymphoma at any age, but it is most common in early adulthood (especially in a person’s 20s) and in late adulthood (after age 55). Gender: occurs slightly more often in males than in females. Family history: Brothers and sisters of young people with this disease have a higher risk for Hodgkin lymphoma. 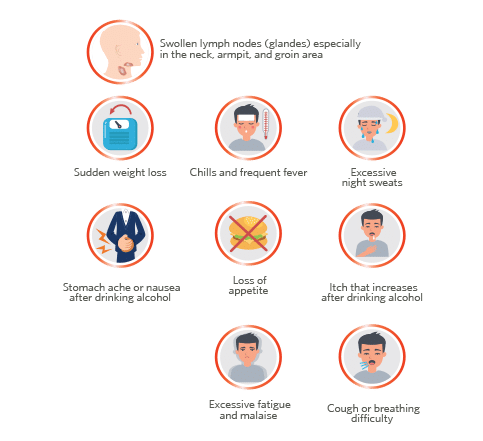 What are the symptoms of Hodgkin Lymphoma? The most common symptom of Hodgkin lymphoma is a lump in the neck, under the arm, or in the groin, which is an enlarged lymph node. Sometimes the only symptom might be feeling tired all the time. What are risk factors of NON-Hodgkin Lymphoma? Exposure to certain chemicals and drugs: such as benzene and certain herbicides and insecticides (weed- and insect-killing substances) may be linked to an increased risk of NHL, Some chemotherapy drugs used to treat other cancers may increase the risk of developing NHL many years later. For example, patients who have been treated for Hodgkin lymphoma have an increased risk of later developing NHL. Radiation exposure: Patients treated with radiation therapy for some other cancers, such as Hodgkin lymphoma, have a slightly increased risk of developing NHL later in life. This risk is greater for patients treated with both radiation therapy and chemotherapy. Body weight and diet: being overweight or obesemay increase your risk of NHL. Other studies have suggested that a diet high in fat and meats may raise your risk. 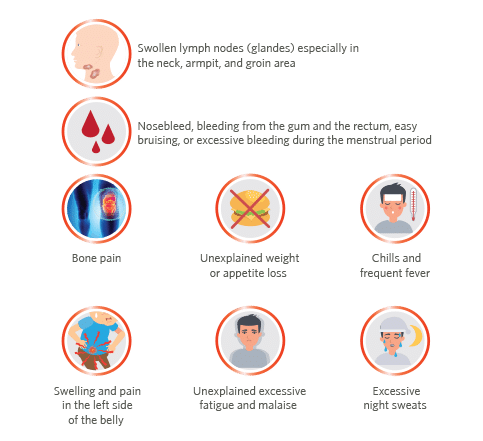 What are the symptoms of Non-Hodgkin Lymphoma? There is not a specific way to prevent Lymphoma. However, avoidance of HIV infection or chemical and radiation exposure may reduce the chance of having Lymphoma. Leukemia is often described as being either acute (fast growing) or chronic (slow growing). Myeloid leukemia: Leukemias that start in early forms of myeloid cells – the cells that make white blood cells (other than lymphocytes), red blood cells, or platelet-making cells (megakaryocytes) (also known as myelogenous leukemias). Lymphocytic leukemia: Leukemias that start in immature forms of lymphocytes are called lymphocytic leukemias (also known as lymphoid or lymphoblastic leukemias). Acute lymphocytic leukemia (ALL). ALL is more common in children than in adults. Chronic lymphocytic leukemia (CLL). CLL mainly affects older adults. Acute myeloid leukemia (AML). AML is most common in older people. What are risk factors of Leukemia? There is not a specific way to prevent Leukemia. However, avoidance of radiation exposure, smoking, and Benzen exposure may reduce the chance of having Leukemia.